Filming in 3D at Sadler's Wells turned out to be quite a different proposition than a usual 2D shoot. In the theatre for a 2D shoot usual camera positions would be from the rear of the stalls and/or the front of the first circle. These would be supplemented by shots from the side galleries either at stalls level or from the first circle. In 3D the cameras need to be much closer to the front of the stage which does cause sightline issues if you have an audience in. 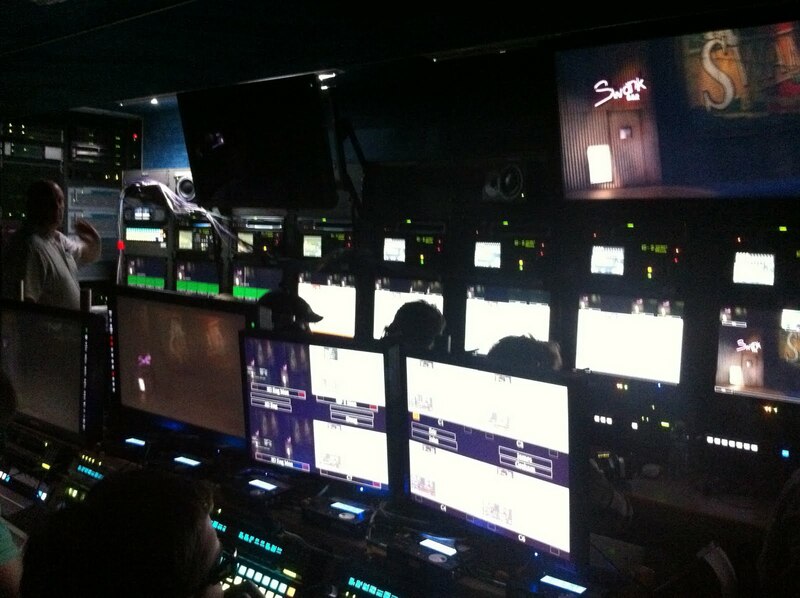 For Swan Lake there were five 3D cameras including two dollies and one on a crane, plus two 2D cameras all set up across the front of the stage. This entailed taking out quite a few rows of seats. I'd always assumed all 3D filming used two lenses next to each other to get a 3D effect but the set up for Swan Lake was a mirror rig which has cameras set at 90 degrees and uses a mirror. What was even more impressive about this was the OB truck parked outside. Apparently it spends most of its time parked outside football grounds doing live 3D broadcasts of Premiere league matches. It expands outwards like something from Transformers. Inside was more like Close Encounters with us all watching the action wearing 3D glasses. This is where the director (Ross McGibbon) and the producers sat. To the left was sound and to the right an individual operator for each camera. Filming theatre in 3D will probably prove to be best done by replicating the "best seat in the house" effect rather than going on stage amongst the action or shooting from unusual angles. Too much movement is likely to make you feel nauseous and unusual angles will break the illusion of a real stage experience. As 3D is so new lessons are being learnt all the time. Apparently 3D can look gloomy compared to shooting in 2D and fast movement is hard to pick up. Also the effect can be distorting with a big drop off between foreground and background (critics of the Mariinsky's 3D film mention this).